This is the time of the year that families who are currently using the public school system or private schools start considering homeschooling instead. They start tip toeing around the topic, checking the scene. It can be incredibly daunting. The good news is there are a lot of people out there who want to help. That’s also the bad news because it can be incredibly overwhelming. But…. there may be questions that you or your friends/acquaintances/strangers you meet at the park have and I’d like to help. While I don’t have all the answers, I am about to finish my fifteenth year homeschooling and that officially makes me a veteran. Whether I like to admit my age or not. If you are already homeschooling, but know someone who may have questions, please share this post with them. Anyone and everyone. People you know or meet or want to meet… anyone that is tossing the idea of homeschooling around and already has questions as well as those who are considering asking questions. You can all come here and post you question(s). I will answer them in another post and my readers (who are fabulous) can also chime in on the questions. The questions can be as specific or general as you’d/they’d like. Pretend we are sitting on the sofa having chai latte together (I’m probably doing that anyway) and let’s chat. Ask away, readers, new and old! 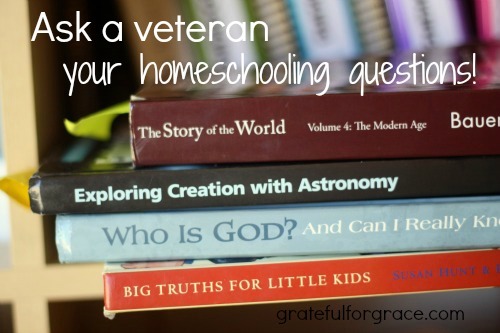 What are your questions about homeschooling? Linking to Mama Moments Monday!